The ancients said that twelve zodiac animals were 12 species of beasts, birds, animals, spirits etc. 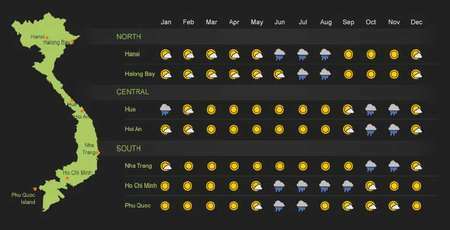 Con Giap or Sinh Tieu are the words for the zodiac animals. Sinh means the year of birth; Tieu means the similarity between the person and the zodiac animal. According to the tradition of Chinese people, 12 animals are used to denote the year off birth which are: Mouse, Buffalo, Tiger, Cat; Asian Dragon; Snake; Horse; Goat; Monkey; Rooster; Dog; Pig. The ancients also said that the year of birth is the same as the fate of the child of that year. For example, the person born in the year of the Mouse holds the mouse spirit; the person born in the year of the pig will hold the pig spirit. 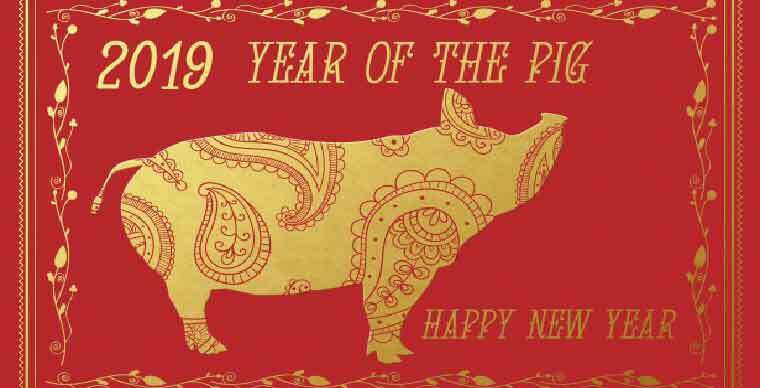 In Lunar Calendar, 2019 is the year of the Pig (Hợi), the last of the 12 animals. Pigs in the concept of many peoples are considered to symbolize voracious habits, and in the field of eating, pigs are considered bottomless. The word has appeared the meaning “worship of stomach”, the embodiment of ignorance, and the expression of selfishness, jealousy. In the survival wheel of Tibetans in China, the Pig is a symbol of ignorance. In fact, in the notions of Chinese and Vietnamese people, the Pig is not a completely bad animal. 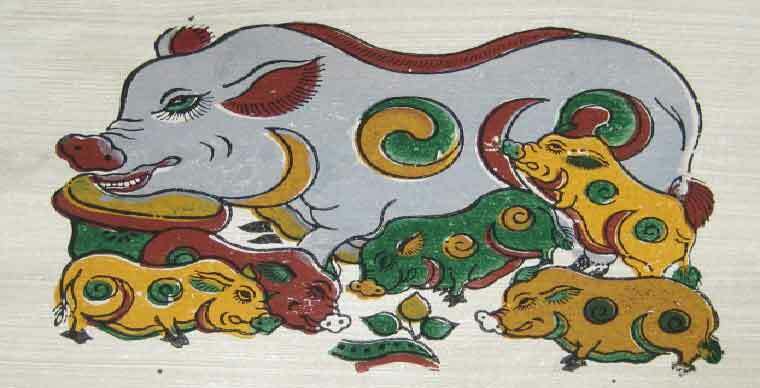 For the Vietnamese, the Pig in the picture “Pigs” of Dong Ho folk painting (Bac Ninh) is a symbol of prosperity and well-being, bringing a vivid colour of Fertility rites and cults. "Dong Ho painting chicken and pig features in the color - Traditional colors glow on windowpane oyster" in “On the other side of the Duong River” by Hoang Cam". That characteristic, the symbol of the Pig is closely associated with the tradition of the wet-rice civilization. Lunar New Year is the day of reunion, towards the source, the day of innovation, optimism and hope. According to the notions of Vietnamese people, in each region, the customs of ritual practices are often slightly different. On December 23rd, Vietnamese families will clean the kitchen to offer to the Kitchen’s God. The traditional ceremony must have goldfish to see him off to heaven, hope he will report to the King of Heaven good things because according to the folk belief this is the day that he will punish or reward homeowners based on what he the Kitchen’s Gods reported. When going to Tet markets, Vietnamese people do not forget to go through the market gate asking for the calligrapher, which can be parallel sentences or a single word. Ancient people often ask for calligraphy to worship with the hope that their children will learn and become people who have the quality of the words. The most favorite words are usually Tâm (conscience), Phúc (good fortune), Đức (morality,virtue), An (tranquil, safe), Lộc (luck, weath, good fortunes). Going to pagodaat the beginning of the year is not simple to wish for the good things in new year but it is also a time for people to find their spiritual place after hard-working days, looking for peace, getting rid of their worries and concerns of the old year. New Year’s Eve worshiping normally includes two ceremonies, an indoor ceremony and an outdoor ceremony. 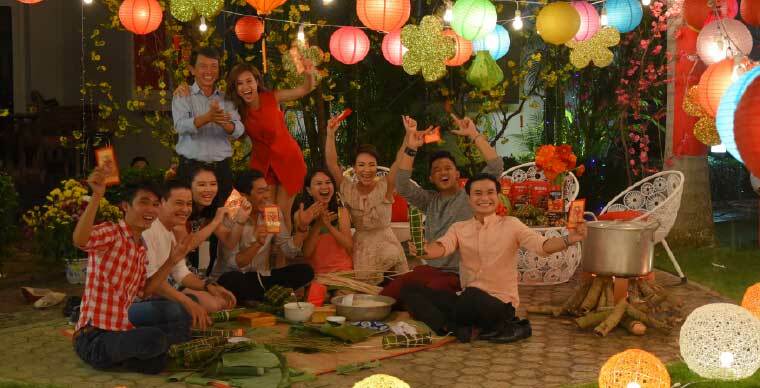 The reason for the Vietnamese people to make it two for the belief that: One year begins, there must be an end and also to remove all the old resentments, welcome the new year with fortune and good things. After the New Year’s Eve worshiping, Vietnamese people will choose good time to depart and go to collect spring-buds, with the wish that the new year will always be lucky and happy, also to bring home good fortunes. Making Banh Chung is a custom that first appeared in the civilization of King Hung Vuong 18th. 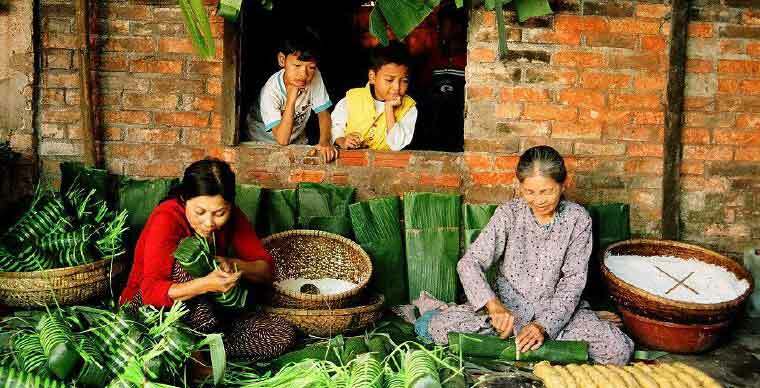 Today, in December 28th and 29th before Lunar New Year, Vietnamese families often gather for making banh chung and banh tet to make Tet gifts or to enjoy family reunion. The person must be an extremely skillful to be able to pack beautiful and tight cakes, otherwise the cake will crack and absorb water and ruining the cake. 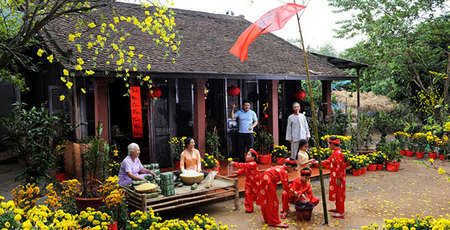 Vietnamese people believe that people who land will decide on a happy, prosperous or unlucky year. Therefore, they often invite people with good fortune, with age to landlords. The landlord must dress neatly, then have to go all the way around the house in the hope that luck will always flood the house owner. 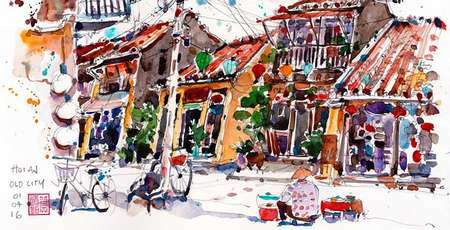 It can be said that Tet wishes are the unique and indispensable culture on Tet holiday. In New Year, everyone wears beautiful clothes, often choosing red for a lucky meaning, and carrying gifts to celebrate for the owner. 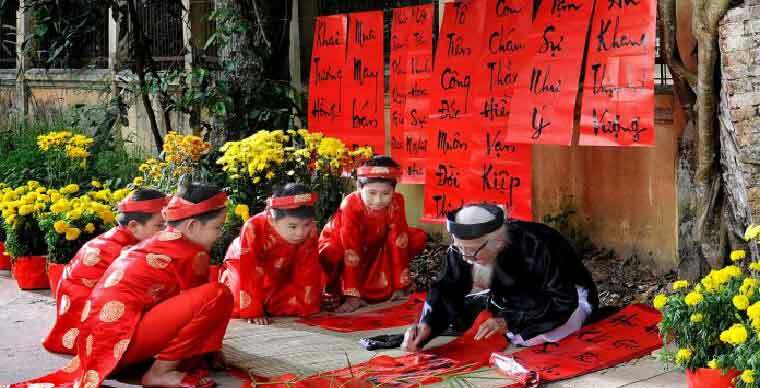 The Vietnamese New Year culture also has the phrase: "Father’s Tet is on the First Day of New Year, Mother’s Tet is on the Second, and Teacher’s is on the Third". Father and mother here are understood as their literal meanings while teacher also represents those who help us understand something new. 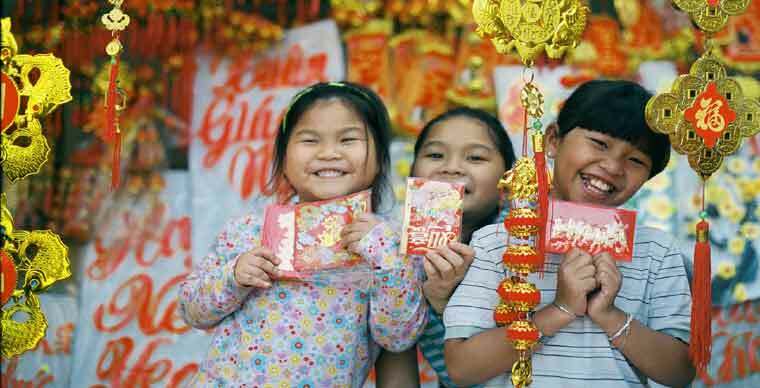 On Tet holiday, Vietnamese people give lucky money to children with the wish that they will be happy, and good at studying. Red envelopes also symbolize luck and happiness. In Chinese culture, unmarried people will still be considered children and allowed to receive envelopes. 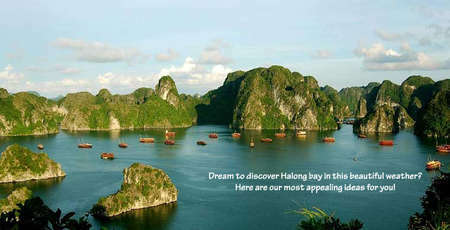 The Lunar New Year is the longest and most anticipated holiday in Vietnam. In 2019, Tet takes place from February 5th to 9th. 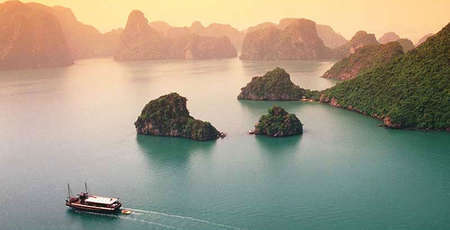 There are some notices worth remembering if you have a plan to travel to Vietnam in this period. When visiting Vietnam at this time, the busiest time of the year, travelers can enjoy themselves in the atmosphere of preparing for the new year from urban to rural. Tourists can choose to visit crowded Tet markets across all three regions of Vietnam, especially the Hoa market in big cities, floating markets in the Mekong Delta, or the ethnic markets in Northern Vietnam during. 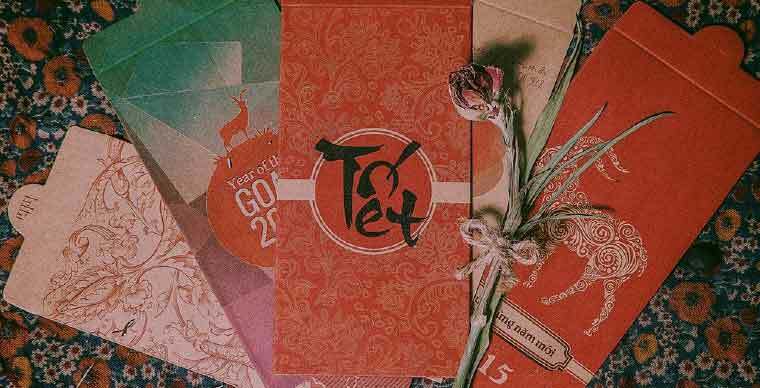 - Difficult to book tickets and soaring prices: Just like Christmas and New Year in Western countries, Tet is the time for family reunion. Thus, the travel demand of people coming home sharply rises, especially with South-North flights and trains. You may have to paya double fare to get your ticket. + The entertainment activities and catering services at this time are mostly interrupted. Very few supermarkets, shops, amusement parks or tourist offices are open on Tet holidays, which partly makes tourists feel boring and inconvenient. + Service prices surged due to labor shortage: The price for tour guide and driver, food in the North can be doubled. + if you are going on vacation in the North on this occasion, hotels with the food service included should be more considered. + Difficult to book tickets and prices skyrocketed: because this is the time when everyone returns to the city to work, travel demand one more time sharply rises. Especially flights, trains heading North - South. You may have to pay a double fare. + To be able to book tickets easily at a reasonable price, tourists should plan their trip as soon aspossible, and should consider South - North tours instead of the reverse way. + Limit your market visits in the travel plans, because markets are still deserted and not as crowded as usual during this period.